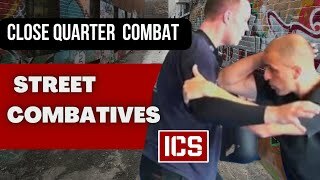 At ICS we specialise in teaching people Close Quarter Combat (CQC), a realistic, modern and extremely effective street self defence system that’s a hybrid blend of many different martial arts and combat fighting styles. CQC is one of the world’s most effective self defence systems & has been lauded as more effective and complete than Krav Maga by those who’ve studied both. Our clients come from all walks of life and all skill levels. You don’t need to be at a certain level of fitness or know anything about self defence or MMA. 90% of our clients are everyday people just looking to improve their ability to defend themselves or looking for an effective, fun and rewarding way to improve their fitness or shred some weight & tone up. If being able survive a real life attack is important to you or you’d like to improve your health and fitness whilst honing your defensive skills then you have found the right place. From Melbourne to Madrid, Sydney to San Francisco, from MMA Champions to Body Guards of the super rich, experts to complete beginners, Integrated Combat Systems has been helping people all over the world better protect themselves with real world self defence training whilst staying fit and having lots of fun! Today CQC is taught to every day people as an effective form of street defence, its prime purpose is to help you develop the ability to quickly and efficiently defend against a violent attack on you, a friend or family member. As a side benefit, participants will gain a high level of fitness, meet new people and have fun doing it. The need for self protection has become a vital part of our existence due to an increase in attacks and sexual assaults within our communities. The Women Safe program is based in Melbourne and implemented Australia wide in High Schools, Corporate Institutions and available monthly to the public in areas throughout Melbourne..
Peter is available for limited sessions each week. Call 1300 721 060 or 0413 311 633 for more details and to book now! Unlimited Sessions FREE For 1 Week! After a week you’ll see how awesome this style of training is and you will feel super confident that you’ll be able to reach your fitness and combat training goals, whatever they may be! Grab unlimited FREE sessions now! Just enter your email below & you’re in! See the ICS Team in action training people just like you how to defend themselves with an array of techniques from different disciplines. “I’m very happy to be training with ICS. Peter’s syllabus is well structured, extremely practical has an excellent focus on applying appropriate actions to real life scenarios. “Peter Sciarra is an internationally recognised martial arts instructor teaching internationally recognised concepts. Having trained under Peter’s Integrated Combat System (ICS) for the past five years, the benefits I have received are numerous and include; increased strength, fitness, discipline and confidence. “After training in martial arts for a decade it is refreshing to find a trainer, who is open minded and knowledgeable within his field. Someone who isn’t afraid to step outside the box and attend seminars and cross train in order to teach us students new or more effective techniques. This says a lot about Peter and his system as it is constantly evolving and I can honestly say I get excited every time I walk through the doors and trek upstairs to train with Peter and his boys. The training environment is clean and well kept, not to mention the students are friendly, approachable and engaging, and no egos are present in this school. This would be an accurate reflection of how Peter Sciarra conducts himself amongst us students, and without a doubt I have never met a trainer quite like him. “Before I started training in the ICS self defence system I had no martial arts experience. I have found the system Peter Sciarra teaches to be intuitive to learn and does not require unrealistic dexterity, flexibility or strength. I have learned useful techniques from day 1 in an environment that is easy going, but focused on proficiency in the skills relevant to each module that Peter teaches. “Having worked in the security industry for over 20 years,and trained in many different Martial Art systems. “Military, law enforcement or protective agents; Book ICS as soon as possible. As a certified instructor in MACP and Gracie GST civilian market training often falls short. Often I go to the Dojo, train go home to adapt the moves. Not with ICS ! Every technique was adaptable for military and Law enforcement purposes.